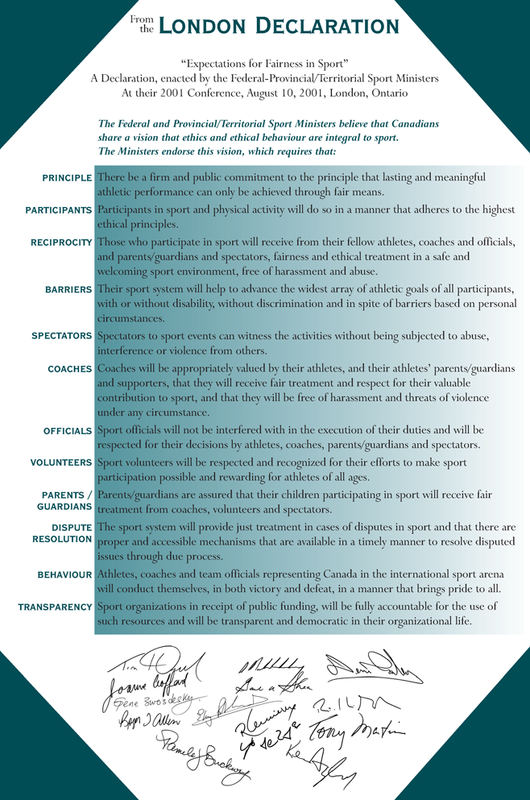 In 2001, Canada’s Federal-Provincial/Territorial Ministers responsible for sport came together to bring ethics and respectful conduct back into the way Canadians play and compete. They believed that damaging practices—cheating, bullying, violence, aggressive parental behaviour, and even doping—were beginning to undermine the positive impact of community sport in Canada. The first step they took in turning back this negative tide was the signing of what is now known as the London Declaration, an unprecedented affirmation of positive sporting values and principles. The Canadian Centre for Ethics in Sport conducted a nationwide survey in 2002, which made clear the important role that sport plays in the lives of Canadians, as well as Canadians’ strong desire to uphold a model of sport that reflects and teaches positive values like fairness, excellence, inclusion, and fun. In September of 2003, leading sport officials, sport champions, parents and kids from across Canada came together through a symposium entitled “The Sport We Want.” Several strong messages emerged from this gathering. First, that Canadians believe sport has the power to foster community engagement and teach young people important skills and principles. Second, that Canadians believe sport in this country could be doing more to fulfill its potential. Third, that Canadians at many levels of sport—from parents and community coaches to Olympians and other elite competitors—were eager for a national initiative that would engage communities and sports organizations across the country. Today, True Sport has thousands of members. A growing number of schools, clubs, leagues, teams, and communities across Canada are declaring that “True Sport Lives Here”. True Sport is supported by the Federal, Provincial, and Territorial Ministers responsible for sport, recreation and fitness through the Canadian Strategy for Ethical Conduct in Sport — A True Sport Contribution, as well as a national charitable organization called the True Sport Foundation.